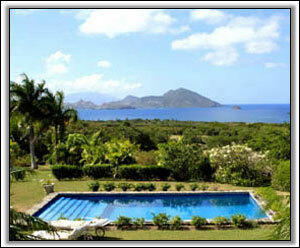 Leeward House is a stunning 2-bedroom, 2-bath villa located on the Round Hill Estate at the north end of Nevis. Two large bedrooms and a private den sleeps a total of five. 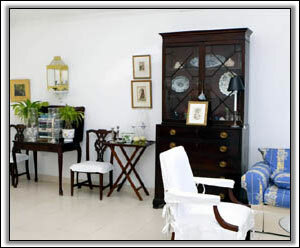 This open, sun-filled house is beautifully decorated with a blend of both antique and contemporary furniture. The house is accented by comfortable cottons and rich mahogany. There are vaulted ceilings and limestone floors throughout. 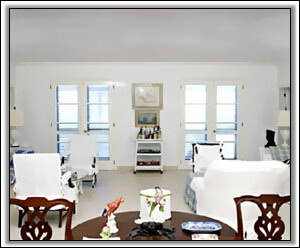 Both bedrooms are air-conditioned and open onto a large covered verandah, which extends the length of the house. The master bedroom has a King-size bed, a bathroom with a tub and handheld shower. 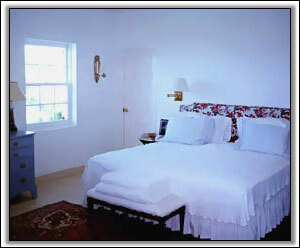 The guest bedroom, located on the opposite side of the house, has twin beds and a large bathroom with a shower. 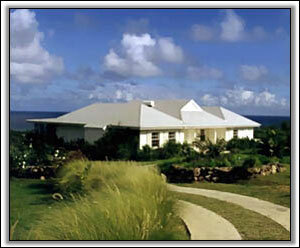 "Leeward House" also has an air-conditioned library with a day bed for a 5th person. 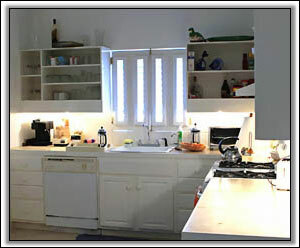 The gourmet kitchen has all the amenities and is air-conditioned. There is a separate laundry with a washer and dryer. The verandah of "Leeward House" overlooks the blue-tiled pool, with panoramic views across the Caribbean and the mountains of Saint Kitts. Adjacent to the pool is a gazebo for shade. The entire property is surrounded by charming, manicured, private gardens. One of the best features of this house, however, is the short 5-minute drive to Nisbet Beach -- one of the best beaches on Nevis. Also, should you desire gourmet dining, simply take a leisurely 1-minute stroll down your lane to the Mt. Nevis Hotel . There are numerous hiking areas nearby, including ruins of the historic Cottle Church built in the early 1800's. 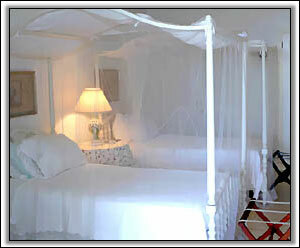 Leeward House has cable TV, fax, stereo, a generator, and welcomes well-behaved children. Staff: Maid Service is provided 5 times per week (included). House Manager: available at all times. 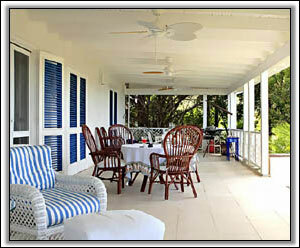 Verandah: Beautiful ocean views with Barbecue Grill, Outdoor Living Room & overlooks the pool. All arriving parties will be met at the airport by our House Manager, Mrs. Liburd. More days for Maid service can be added upon request at an additional cost. A rental car & driver's license can be arranged in advance but must be paid for separately. Plus 9% Government Accommodation Tax. Due to SPAM filters, to ensure delivery, please DO NOT change e-mail subject.